Original vintage Bollywood movie poster of the epic Hindi film, Mother India (1957) for sale. This is an actual surviving vintage Bollywood poster print of one of the longest running films in Indian cinema, Mother India. Printed and circulated somewhere in the late 1970s, this hand painted Bollywood poster was originally designed for publicity of the film but never ended up being used. Very few original hand drawn Mother India posters have survived in intact condition after the film was first released in 1957. These vintage hand painted Bollywood posters were printed as part of the film's nationwide publicity campaign and distributed to cinemas for advertising. Only a handful of unused Mother India posters have survived from the era. The original, vintage Mother India poster featured here is one such rare poster print that has survived in 100% intact condition. This poster bears the original signature stamp of the printing press at the bottom (Dnyansagar Litho Press Bombay) and has been certified as an authentic, vintage original. Mother India (1957) is an epic Hindi film that has the distinction of being India's first film to be nominated for the Oscars in the Best Foreign Film Category. One of the most expensive films made in Indian cinema, Mother India is considered unanimously as the ultimate tribute to Indian womanhood. 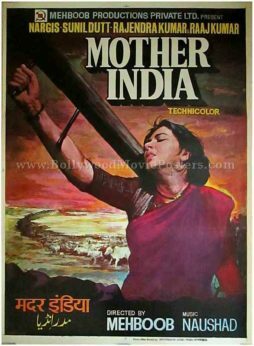 Mother India is one of the longest running films in Indian cinema and has an instantly recognizable hand painted poster. Thanks to its dramatic hand painted artwork, the Mother India poster stands out as the most iconic of all hand painted old Bollywood movie posters ever designed in Indian cinema.